Integrating NFC tags into the operation of Swing by Swing has been a long term goal of ours, and finally we have the project under way! If you are using an Android device (non Samsung unfortunately), then I hope you can get just as excited about NFC as we are! It is a shame that Apple has not yet integrated an NFC reader into their devices, but we are optimistic for the next model. And when Apple does add NFC, we will be ready and waiting to get it integrated with Swing by Swing. So how is NFC integrated into SbS? Simply put, our goal with NFC is to help you keep your phone in your pocket and stop fumbling around with it on the golf course. NFC will not help with score entry (yet) but it can help you get distances and track your shots for the initial launch. We are also always listening to SbS users on how we can improve, so drop us a line. NFC with Swing by Swing is all meant for in-round play. NFC tags operate on two screens: the settings page where you setup your tags, and the in-round display as you play your game. Below, we will go over the setup process, but for now, lets talk about in-round usage. Each tag has two actions you can program to it. The first action (think of it as a single click) is performed with a single swipe of the tag across your phone. You will hear a single beep after about a second and a half if the tag is read properly. The second action is performed when you leave your tag in range of the phone for that full second and a half (think of this as a double click). You should hear a double beep when this action is successfully performed. Why two actions? 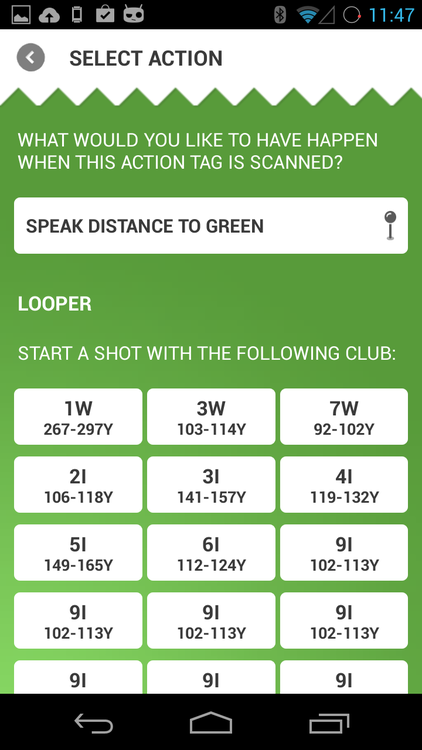 For clubs, this gives the ability to both start a shot, and delete an existing shot if you need. Say you pull out that four iron and slice it into the puddle up ahead. Having a second action set to delete shot will allow you to scratch that record. Aside from Club Tracker integration, you can setup a tag to speak your remaining distance to green center. Typically you would attach this tag to your glove, or wear on your wrist. What tags should you use? We are just starting with NFC, so we have no official equipment to offer at the moment. There are some reputable online dealers you can buy your tags from at very low prices. You will probably be attaching the stickers to the shaft of your club. Make sure they are ANTI-METAL NFC stickers, or they will not work on a metal shaft. Read / Write is needed. 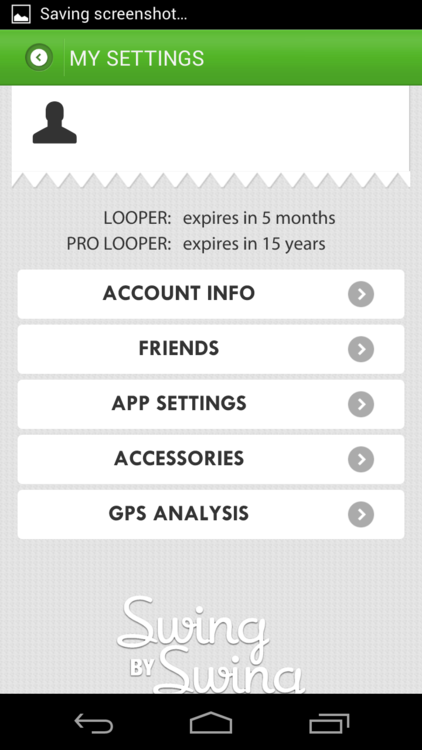 During the setup process, we need to be able to configure the tag to alert Swing by Swing. For this, it must be written to. Get a wrist band tag, or something you can attach to your glove. This one would be configured to speak distances. For me that always comes before the club selection, and is the most used tag I have configured. Get a tag for every club in the bag, even your putter. When you configure your clubs to track shots, you will have most clubs end the current open shot and start a new one with the club you have selected. For the putter, you can configure it to just end the current open shot. So how is this all setup? Open Swing by Swing, and navigate to Application Settings. 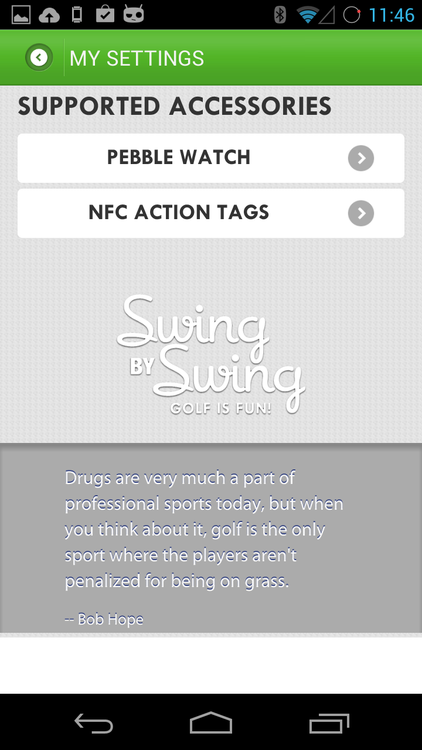 Under accessories -> NFC Action Tags, make sure your phone is compatible and NFC is enabled in Swing by Swing. 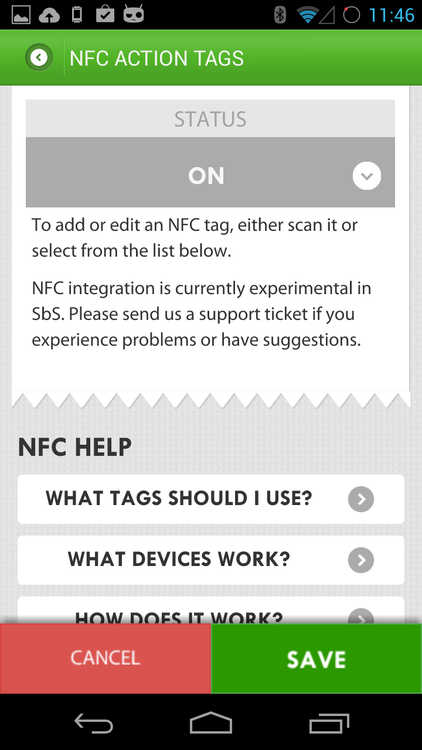 On the NFC Action Tags screen, swipe your tag. You will arrive at a sub screen which will allow you to select your primary and secondary action for the tag. If you did not get to this screen, try force closing Swing by Swing and then opening it back up. For a primary action, we recommend setting it to start a shot with the club you have that tag attached to. (Unless this is your wearable tag, then set it to speak distance to green.) For a secondary action, we recommend setting it to delete any open shot. This will help you trash those unmentionables. For your putter, set the primary action to end any open shot. We love hearing from SbS users, and all our great ideas start with you. Lay it on thick if you must - we have a tough skin. We also want to know if this technology is as exciting to you as it is to us!